On the evening of September 13th, members from across the Williams community gathered in the Faculty Club to attend a private dinner lecture with renowned presidential historian George H. Nash. 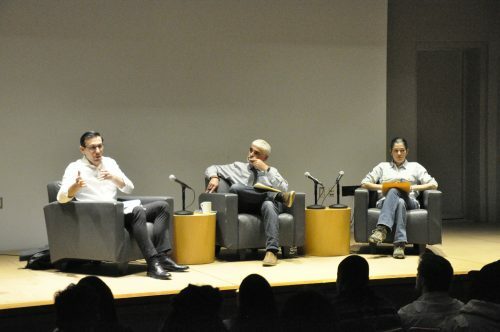 This event, organized by the Society for Conservative Thought and generously sponsored by the Department of Political Science, was attended by thirty students, five professors, administrators, and a representative from the Intercollegiate Studies Institute. Recently inducted Williams President Maud S. Mandel attended the reception. The Society for Conservative Thought earnestly thanks the Department of Political Science and the various College officials that were vital to the success of this event. 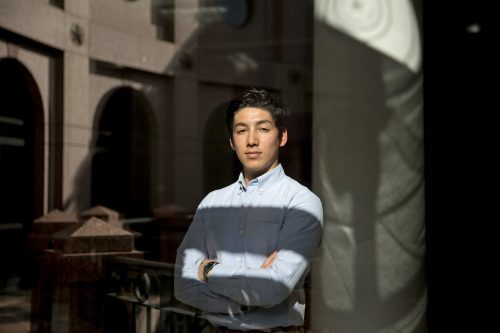 Last fall, when John DiGravio arrived as a freshman at Williams College — a private, liberal arts institution in the Berkshires — the conservative from Central Texas expected to be in the political minority. He did not expect to be ridiculed. At first Mr. DiGravio was taken aback. Then he took his outsider status as a calling. A few months earlier he had started a small, conservative club. He decided to make it bigger. He invited a speaker to give an evening talk on “What It Means to Be a Conservative.” Dozens of students showed up. “I think I really hit a chord,” he said. These days, elite students like Mr. DiGravio, who can financially and/or academically choose from an array of colleges, are often obsessed with “finding the right fit.” Surveys like ones conducted by EAB, an education consulting firm in Washington, routinely indicate that for this group, “fitting in” is one of the top factors when deciding where to go to school. But some students, like Mr. DiGravio, 19, are discovering the pros and cons of being an outsider. On Wednesday, January 10th, the Society for Conservative Thought held its inaugural public event featuring Chris Gibson’s presentation,“What it Means to Be a Conservative.” Dr. Gibson previously served as a U.S. Army colonel and U.S. representative, and is currently Stanley Kaplan Distinguished Visiting Professor of American Foreign Policy in the Williams leadership studies program. 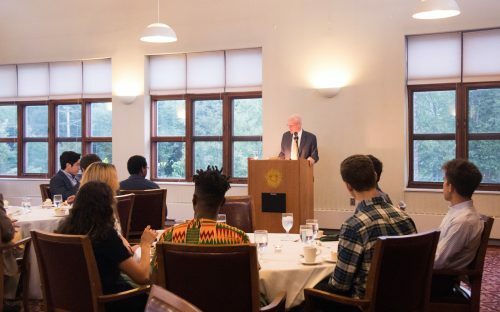 Addressing the audience of 45 students, administrators, and community locals, Dr. Gibson asserted the importance of the “conservation of the founding principles” and the recognition of their enduring value in the modern world. With many references to American history and European political philosophy, he described the miracle of the American political experiment and the critical need to maintain “the spirit of Philadelphia” which conceived of it. Students then stayed for over an hour to participate in a Q&A session in which Dr. Gibson outlined concrete legislative actions to improve the American political system, drawing upon his experiences from serving in Congress. Following the discussion, the Society offered complimentary copies of Dr. Gibson’s most recent book, Rally Point: Five Tasks to Unite the Country and Revitalize the American Dream, courtesy of the Society’s budget. The invitation of distinguished guests to voice conservative principles on campus is essential to the mission of the Society for Conservative Thought. If you can refer such individuals who would be interested in contributing to a future event, please contact jjd6@williams.edu. I am pleased to announce that the student representatives of College Council have formally approved the incipient Society for Conservative Thought as a registered student organization. This milestone has been made possible through the tireless and earnest contributions of faculty members and many students, to all of whom I am deeply grateful. Since my arrival at Williams as a freshman this fall, I have become increasingly alarmed by the extent of the liberal intellectual uniformity of the curriculum and campus community. Fellow students upholding all varieties of political and social beliefs have confided to me their concerns that the explicit liberal bias is inhibitive to the attainment of a well-rounded liberal arts education, and that alternative views are frequently neglected, misrepresented, and ridiculed without basis. This close-mindedness breeds a shallow and hegemonic intellectual environment in which students do not feel able to freely express non-conforming ideas. As asserted by the campus administration during the First Days presentations, it is a mission of the College to promote diversity “in all its forms.” Diversity, however, should not be restricted to classifications of racial, sexual, and socioeconomic identities—at an educational institution, it must include diversity of thought. Though the administration has openly acknowledged the problem of liberal homogeneity in the official 2005 Diversity Initiatives Self-Study, in which students described “a lack of tolerance of diversity of thought” regarding conservative philosophies (pg. 10), the College has taken no meaningful measure to improve the situation and there are no existing student organizations dedicated to the study of conservative beliefs. The Society for Conservative Thought is the product of the current student movement to broaden the intellectual diversity of the College and establish an academic refuge where students can engage with the rich intellectual tradition of conservatism in the vein of Edmund Burke and Russell Kirk. As a non-partisan and non-activist organization, we invite students of all varieties of political and social beliefs to expand their academic horizons and study, discuss, and even challenge ideas that are underrepresented in the Williams curriculum. Unlike other student organizations which have attempted to prompt dialogue through spectacle and incendiary controversies, the Society will foster a genuine understanding and appreciation of conservative principles through group readings and discussions, debates, and invited speakers. The Society is sponsored by the Intercollegiate Studies Institute, a prestigious and well-endowed organization founded by William F. Buckley Jr. in 1953 for the promotion of conservative ideas on college campuses. Through ISI, the Society has access to educational resources, a bureau of distinguished speakers, and special off-campus events, all free of charge. I understand that there is a strong contingent of alumni who are rightfully disaffected with the intellectual climate of the College. To alumni: may this message inspire you with the knowledge that there are many among the student body who share your concerns and are striving to right the situation. The Society will be a liaison between the student and alumni communities, and we look forward to hearing your advice as we forge lasting bonds of friendship in our joint effort to establish true diversity of thought at the College. Please contact me to learn more and become involved in our mission—Williams needs you. At this moment the intellectual affairs of the College face a fateful crossroads of critical importance. By the end of this academic year, the two most prominent campus advocates for free thought will have retired and graduated, and a new president will be taking office. For over two centuries, Williams has formed the minds, hearts, and souls of generations of students who have effected incredible and outsized impacts on our nation and the world. Will the College endanger this legacy by continuing to stifle the holistic intellectual growth of its students? Perhaps, but I promise that the Society will do everything within its power to provide Williams students with a refuge for free thought and the unprejudiced study of the true, good, and beautiful. Society activities will commence during the Winter Study period. We will read selections from William F. Buckley Jr.’s God and Man at Yale, Roger Scruton’s The Meaning of Conservatism, and Allan Bloom’s The Closing of the American Mind, as well as host a number of speakers drawn from distinguished faculty members and alumni. Those with questions or interest in our efforts may contact me at jjd6@williams.edu. EphBlog is powered by WordPress and delivered to you in 1.178 seconds using 31 queries..